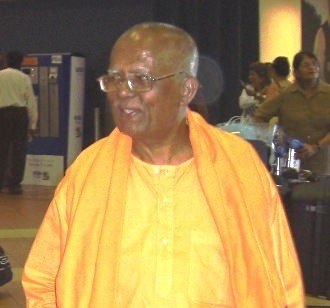 Swami Brahmarupanandaji Maharaj (72), a senior monk of the Ramakr ishna Order of Belur Math, India arrived in Durban on 6th February 2008. He is a South African born Indian Swami who went to India in 1959 and in 1961 he had mantra diksha (initiation) from Swami Shankaranandaji Maharaj in Belur Math. Later in 1968 he was initiated into sannyasa diksha by Swami Vireshwaranandaji Maharaj. After a long stint of service in Madras Math, Nattarampalli, Mangalore in India and in Singapore he retired from active service and for a few years has been staying at Ulsoor Ashrama in Bangalore, India. He had undergone a bypass surgery in 1997 at Chennai. At the airport, he was visibly joyful and happy to have reached South Africa. He would like to tour all the Sub-centres of the Ramakrishna Centre of South Africa during his stay. It was a privelege to meet Swami Brahmarupanandaji this past weekend. Us devotees in South Africa will definitely enjoy his holy company. Great to see a write-up on Palani Maharaj also! Now we get his blissful company at our Ulsoor Math! I am happy that you have the holy company of Revered Palani Maharaj at Ulsoor Math. Here in this country he is well known by his monastic name Swami Brahmarupanandaji. I hope you are aware that he was born South African. A very amiable sadhu, loved by every one!